Located on the Coromandel coast off the Bay of Bengal, Chennai, the capital city of Tamilnadu is a vibrant mix of new and old. Believed to be over 300-years old, Chennai is known for its outstanding educational institutes and economic centres. Every few hundred kilometers from here, a traveler lands at a totally new destination, so much different and yet so much similar to the rest of Tamilnadu in many ways - right from the landscape, culture, history, heritage to the cuisines and more. If you live in Chennai and have itchy feet, read on further to know about all the destinations you could go exploring on your weekends. 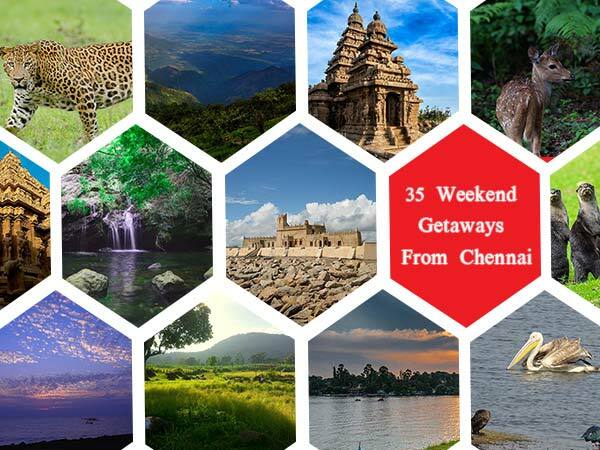 Whatever is your travel style, whether you are a foodie or an adventurer or a history enthusiast or a wildlife photographer, we are listing out 35 brilliant weekend getaways from Chennai - just for you! Home to India's second largest lagoon - the Pulicat Lake - Pulicat, also called Pazhaverkadu is a seashore town located on the border of Tamil Nadu and Andhra Pradesh. Located just about 55 km from Chennai, this beautiful lake is famous for its bird sanctuary and is a favourite destination amongst nature lovers, photographers and birdwatchers. It is famous for hosting the annual Flamingo Festival which celebrates the arrival and nesting of migratory birds. The ancient port town of Mahabalipuram, historically called Mamallapuram, is a treasure trove of history, art and architecture with its stunning historical and archaeological sites. The town is a renowned UNESCO Heritage Site that attracts visitors from across the globe. Travel back in time with a visit to this heritage town in Tamil Nadu. Home to an amazing forest trail in the Eastern Ghats, Nagalapuram is a haven for adventurers. The lush forests, glorious waterfalls and sparkling, natural water pools all add to the thrill of trekking on this lesser-known trail. Located close to the famous pilgrimage town of Tirupati in the Chittoor district of Andhra Pradesh, Nagalapuram is a favoured weekend getaway for travellers from Chennai as well as Bangalore. Located at a distance of about 72 km from Chennai, Kanchipuram, also referred to as Kanchi, is a melting pot of history, culture, religion and heritage. This ancient capital of the Pallava dynasty, along with its numerous beautiful temples, is famous for its numerous silk and cotton industries today. Located in the Kanchipuram district of Tamil Nadu, Vedanthangal Bird Sanctuary is one of the oldest waterbird sanctuaries in India. The migratory season attracts tourists and enthusiasts from all over the country to witness the colourful birds, including some rare species that gather here every year. Vedanthangal would be an ideal destination to travel to even with children. This famous place of pilgrimage is a hotspot for tourists visiting the southern part of country. The holy city of Tirupati is located in Andhra Pradesh, about 133 km from Chennai, and is frequented by visitors from Bangalore, Andhra Pradesh and Chennai round the year. The main attraction is Sri Venkateswara Temple perched atop the picturesque Tirumala Hills, along with several waterfalls, caves and the Venkateswara National Park. Famous for the Vellore Fort that dates back to the 16th century, Vellore is a city in the South Indian state of Tamil Nadu, located at a distance of approximately 139 km from its capital city of Chennai. The fort in all its grandeur is home to beautiful temples with ornate sculptures, a feast for photographers and art appreciators. This village in the Chittoor district of Andhra Pradesh is home to an 11th-century fort, famously known as the Chandragiri Fort. The historical fort also houses an archaic palace within. Several temples, other palaces and structures in the premises, mostly in ruins, are all under the Archaeological Survey Of India (ASI) now, making it a perfect place for history buffs, photographers and architecture enthusiasts. Fondly known as Pondy, Pondicherry or Puducherry is a union territory and one of most famous tourist destinations in South India. The city boasts of lovely beaches, colonial heritage and bohemian vibes, attracting tourists from across the world. Travellers agree that for a relaxed weekend, good food and vibes, Pondy can be visited over and over again. The city of Nellore is located in the Nellore district of coastal Andhra Pradesh. Nestled on the banks of river Penna, Nellore is a pleasant drive from Chennai. The city was historically referred to as Vikrama Simhapuri. With historical evidences of lineages of many powerful kingdoms and dynasties, the place has a rich history and heritage. One of the holiest places in Tamilnadu, Tiruvannamalai is a profoundly beautiful place. Surrounded by the verdant Arunachala Hill, which is believed to be the manifestation of Lord Shiva, the place emits peace and divinity. Not just the believers, the place also attracts travellers, adventurers and nature lovers with its magnificent hills, caves, waterfalls, forest trails and more. The picturesque hill station of Yelagiri is located in the Vellore district of Tamil Nadu. Known for its scenic beauty and pleasant climate, Yelagiri is a favoured tourist destination. The drive to the Yelagiri is a pleasant one with beautiful vistas. It is also a popular destination for numerous adventure activities including rock climbing, trekking, waterfall rappelling and paragliding, and therefore, attracts travellers with all kinds of interests. The temple town of Chidambaram is located in the Cuddalore district of Tamil Nadu. It is famous for its Thillai Nataraja Temple that worships Lord Shiva in the form of Nataraja - the cosmic dancer. Chidambaram is also known for the surrounding Pichavaram wetlands, the second largest mangrove forest in the world, that add to its natural beauty. The charming hill station of Horsley Hills is located in Andhra Pradesh. With a rich flora and fauna, the Horsley Hills are actually a chain of hills huddled together, creating a mesmerising landscape. Travellers can explore the many waterfalls, lakes, trails, heritage and pilgrimage sites. The adventurous one can also indulge in activities like trekking, waterfall rappelling, wildlife safari, boating and more. Tranquebar, also Tharangambadi, with its name meaning place of the singing waves, is a heritage town in the Nagapattinam district of Tamil Nadu. Imprints of the rich Danish history and culture can still be seen here through the stunning Dansborg Fort, the colonial houses, churches and museums. Get transported to an era that's at least two centuries old with a visit to Tranquebar. Bound by river Cauvery in the north and river Arasalar in the south, the temple town of Kumbakonam is located in the Thanjavur district of Tamil Nadu. Distinctly defined by the intricately carved, tall gopuram, the temples tell tales of the many powerful empires and dynasties that have served them. Kumbakonam is also famous for betel nuts, brass articles and a special, thick, strong coffee. If you are a foodie, the name would have already rung a bell. Popular for the delicious Chettinad cuisine, Chettinad is a region in eastern Tamil Nadu. Chettinad is a must-visit place for every foodie traveller. Enjoy a relaxed weekend with a drive to Chettinad and relish the delectable traditional cuisine, with a heavenly aroma and taste of freshly ground spices. Once a major port town on the Coromandel Coast of Bay of Bengal, connecting with Greece and Rome, Velankanni in Tamil Nadu is now a major pilgrimage centre. The Basilica of Our Lady of Good Health is the major attraction that is frequented by believers from all over the country. Velankanni Beach is another popular spot where the tourists head to when in the town. Located in the central Tamil Nadu, Kolli Hills is a mountain range in the Eastern Ghat. It is one of the offbeat, and therefore, pristine destinations that every nature lover must visit. With an extremely rich and diverse flora and fauna, the hills are home to tranquil cascades - the most popular one being the Akash Ganga Waterfall - along with several picturesque forest trails, an ancient Shiva temple and an expansive wildlife. Nestled in the Shevaroy hill ranges in the Eastern Ghats, Yercaud is a charming hill station and a popular tourist destination in Tamil Nadu. Fondly referred to as Jewel of the South, Yercaud is located in the Salem district. It is famous for one too many things, including the emerald Yercaud lakes, panoramic viewpoints, aromatic orange groves, sprawling coffee, cardamom and black pepper plantations. Located on the banks of river Vaigai, Madurai is one of the most popular and third largest city in Tamil Nadu. The major attraction here is the legendary Meenakshi Amman Temple. From a vantage point, one can see, not one, not two, but fourteen brilliantly coloured and ornately carved gopurams that adorn the grand temple. Travellers from all over the world come to experience the grandeur of this temple built in the Dravidian style of architecture and marvel at the myths and lore of the temple. Fondly referred to as High Wavy Mountains, Meghamalai translates to "cloud mountains" in the local parlance. The serene mountain range is located in the Western Ghats of the Theni district in Tamil Nadu. This pristine destination is also home to the exotic Meghamalai Wildlife Sanctuary, Meghamalai Falls and sprawling slopes of tea and spice plantations. Located by the foothills of Chamundi Hills, Mysore was the capital of the Wodeyar kingdom. It is refreshing weekend getaway for travellers and bikers from nearby cities and towns. Along with the famous Mysore Palace, Mysore, or Mysuru, has a lot to offer to the travellers. Visit the heritage city for its stunning monuments and buildings, palaces, museums, the zoo and more. The BR Hills or the Biligiriranga Hills are located in the Chamarajanagar district of Karnataka. A favoured destinations of nature lovers and adventurers, the place gets its name from the ancient Biligiri Ranganatha Swamy Temple that is perched atop the lofty hills. The region also falls under the protected area and is home to an expansive BRT Wildlife Sanctuary. Known for its scenic beauty amplified by the lush hills, glistening lakes and waterfalls, verdant valleys and a pleasant climate, Kodaikanal is a popular hill station situated in Tamil Nadu. Fondly called the Princess of Hill Stations, the name Kodaikanal means "gift of the forests" in the local language and rightly so, with its magnificent landscapes that pull visitors from across the country. Located in the Nilgiri Hills, the charming hill station of Coonoor is famous for one too many things. Coonoor is most visited by tourists to experience the famous Nilgiri Mountain Railway that journeys through the aromatic nilgiri or eucalyptus forests and sprawling tea estates. It is also a popular destination for trekking and adventure as well as leisure activities. Located near Mysore in Karnataka, Kabini Wildlife Sanctuary, or Kabini National Park, is one of the most popular wildlife destinations in this part of the country. The region used to be the hunting grounds for the British in the olden days and was declared a national park in 1988. It has the most enchanting forest trails with lush meadows, waterfalls and dense thickets. Kabini is a must-visit for nature lovers, photographers and adventures. The temple town of Rameshwaram, located on the Pamban Island, is a famous place of pilgrimage. The Shiva Temple, considered to be one of the 12 Jyotirlinga Shiva temples, attracts lot of devotees from across the country. Rameshwaram is also a popular choice amongst travellers due to the sea bridge of Pamban and the ghost town of Dhanushkodi. With its roots in mythology and history, the town has many interesting stories and legends associated with it. The place is truly a photographer's delight with its surreal landscapes. Also known as Rajiv Gandhi National Park, Nagarhole National Park is located in the Mysore and Kodagu districts of Karnataka. With a rich biodiversity, Nagarhole is also a part of the Nilgiri Biosphere Reserve. Home to numerous beautiful species of flora and fauna, the park is brimming with abundant natural beauty. With its thick forests, hills, waterfalls and streams, Nagarhole is a must-visit for every nature lover. Udhagamandalam, or more popularly known as Ooty, is one of the famous hill station destinations in South India. Located in the Nilgiri Hills, Ooty is a favoured destination for honeymooners, nature lovers and adventures. Tourists visiting Ooty can enjoy the pleasant weather, walk amidst the refreshing pine forests, go boating on the emerald lake, see the fossilised trees in the botanical garden, take a joy ride on the Nilgiri Mountain Railway and more. One of the first wildlife sanctuaries in India, Mudumalai Wildlife Sanctuary, or Mudumalai National Park, is situated in the Nilgiri Hills in Tamil Nadu. The name Mudumalai translates to "old/ancient hills". The park is considered to be one of the most beautiful sanctuaries with its picturesque landscape filled with thick forests, glistening waterfalls and streams, and its rich population of animals, birds, reptiles and insects. Mudumalai is a must-visit destination for every wildlife enthusiast. Filled with abundant scenic beauty, Thekkady, located in Kerala, is popular for the Periyar National Park and the Periyar Tiger Reserve. Spread across a vast area, the Periyar National Park has thick evergreen forests, which are home to exotic flora and fauna. One can enjoy a cruise on the beautiful Periyar river. Not just for its scenic beauty, Thekkady is also known for its aromatic spices. Fondly known as the Scotland of India, Coorg is one of the popular hill station destinations in South India. Famous for its misty hills, lush coffee plantations, numerous trails, gushing waterfalls and pleasantly cool climate, Coorg is often the top choice for travellers and tourists looking for family vacations, adventurous or leisure holidays. Nestled in the foothills of the enchanting Nilgiri Hills in Tamil Nadu, Masinagudi is an exotic wildlife destination that every wildlife enthusiast must visit. Travellers are rewarded with an overwhelming experience of the rich wildlife, refreshing forests, pleasant weather and abundant natural beauty. The place is a haven for wildlife photographers and adventurers. Situated in the picturesque Western Ghats, Munnar is a charming hill station located in God's Own Country, Kerala. Surrounded by verdant hills and sprawling tea estates, Munnar was the summer retreat for the members of the British elite in the olden days. With some of the most scenic trails, like the Anamudi Peak in the Eravikulam National Park that is home to the endangered Nilgiri tahr, and gorgeous waterfalls and abundant natural beauty, Munnar is a must-visit place for every traveller.